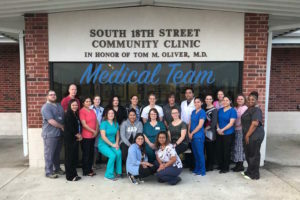 The Tom Oliver S18th Community Clinic includes a medical and dental clinic that serves the vulnerable population of our community. Our providers offer excellent prenatal care, infant and pediatric care as well as medical care for adults and the elderly. We have two eligibility screeners available for financial assistance, a nutrition counselor, and WIC clinic on Fridays. This beautiful facility os convenient to South Waco and offer laboratory, x-ray and ultrasound services. 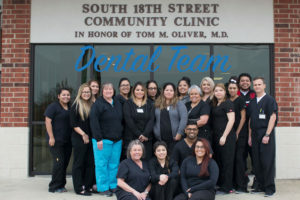 We are proud to serve our community and welcome new patients, children, and adults to receive exceptional medical and dental services. We focus on your child’s physical, mental & emotional well-being through all the stages of development. We offer Gynecological services and well woman care. Our physicians and staff value the opportunity to serve our patients. Protect you and your children from preventable diseases by keeping immunizations up to date. Contact your healthcare team today! Our in-house laboratory is available for phlebotomy services among other tests. Contact our office today for more information. We offer Obstetrics services and well woman care. Our physicians and staff value the opportunity to serve our patients. We help manage chronic illnesses such as asthma, diabetes, and hypertension. Being your primary care provider, we will sometimes recommend you see a specialist to assist us with coordinating your care. If a referral is needed, we will work with you on setting up your appointment. Early detection and treatment of problems with your gums, teeth and mouth can help ensure a lifetime of good oral health. You should have an exam twice a year. Find out why it is important to keep your teeth clean and how you can prevent gum disease from developing. Make an appointment now. We start seeing babies at 6 months of age (with or without teeth). We will help you take care of your child’s oral health as they grow. We provide dental services to mothers during their pregnancy to help them give their babies the best start to a healthy mouth. Poor oral hygiene allows plaque and tartar to accumulate and cause cavities (holes) in your teeth. If not fixed, the hole gets bigger and can cause a toothache. We can help you stay out of pain and keep your teeth. Adults can lose their teeth to gum disease, a process that dissolves the bone that supports the teeth. Avoid the bad breath, bleeding gums and loose teeth by having gum disease treated. Replacing missing teeth can give you something to smile about.